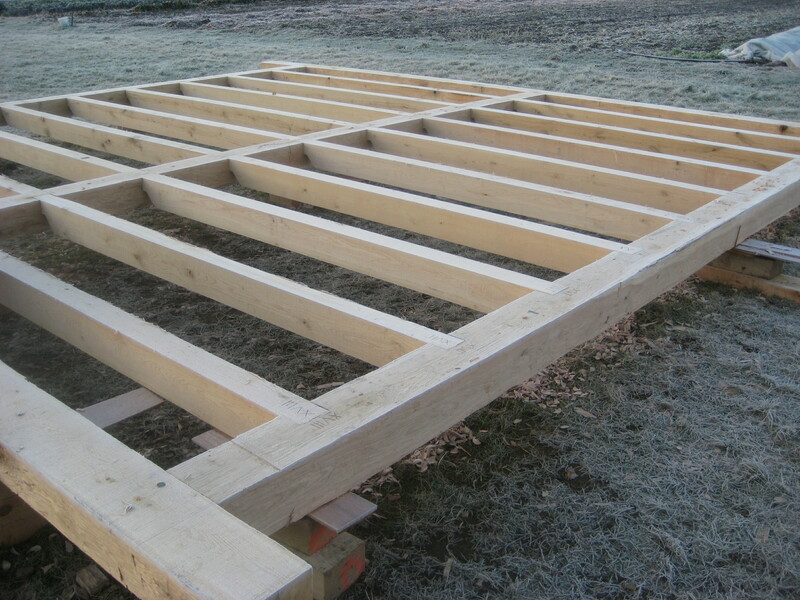 We recently posted on some square rule Timber Framing work. As a contrast, today we’ll take a look at an earlier form of timber framing known as ‘Scribe Rule’. In contrast to ‘Square Rule’ timber framing with interchangeable parts, pieces of a scribe rule timber frame are each scribed to one another — so each piece can only be used in a single location. 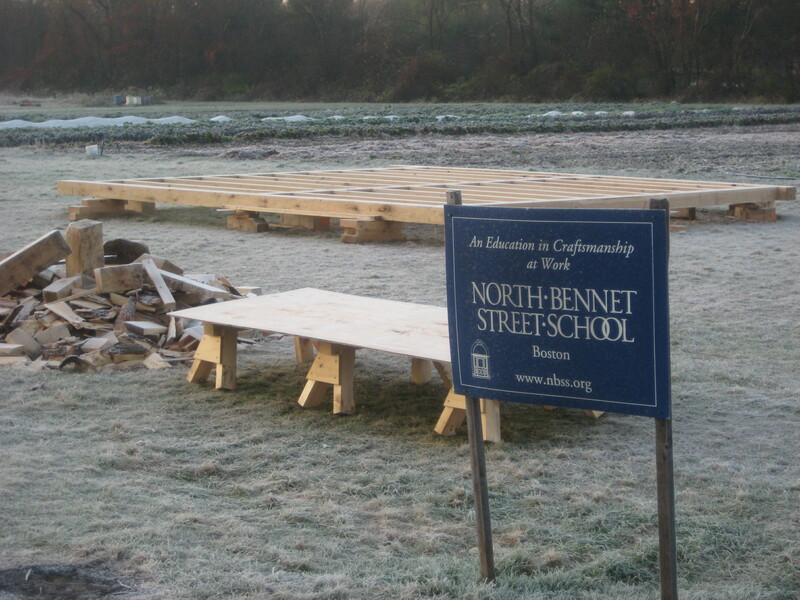 Back in 2009 as part of a North Bennet Street School Project at Brookwood Farm we worked on restoring the timber frame for a 2 bay English Style barn that was thought to be the oldest such barn in New England. Against the odds, the dendrochronology results were inconclusive which was disappointing, but based on what we can tell from what was left of the barn, even if it’s not the oldest it was/is still a notable barn both for some of the old world design and techniques used in its original construction. The barn was found when a parks employee ran into the side of this barn (which was attached via ells to several other barns at Brookwood farm) with a tractor and uncovered posts that looked hand hewn. From there the school was eventually called in, and after careful evaluation and research by Steve O’Shaughnessy, Rich Friberg and others that this barn was indeed a rare bird and worth preserving. The class of 2009 and 2010 carefully dismantled the barn, cataloged the pieces and loaded it into a tractor trailer that now resides at the school (at the time of this writing). In or around May 2012 the restored/repaired frame should be raised again — I hope to post more on that if I am present for the barn raising. The sills and floor structure of the barn were severely rotted, missing or replaced by the time we got to the barn, so in order to repair the barn we needed to start at the bottom and work our way up. This started with hand hewing new sills from oak. 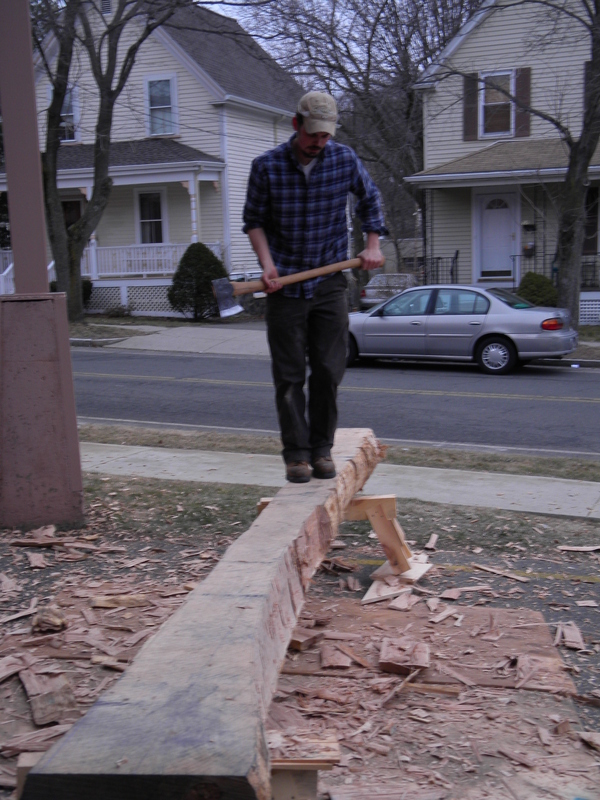 Bill notching in on the side of a timber. 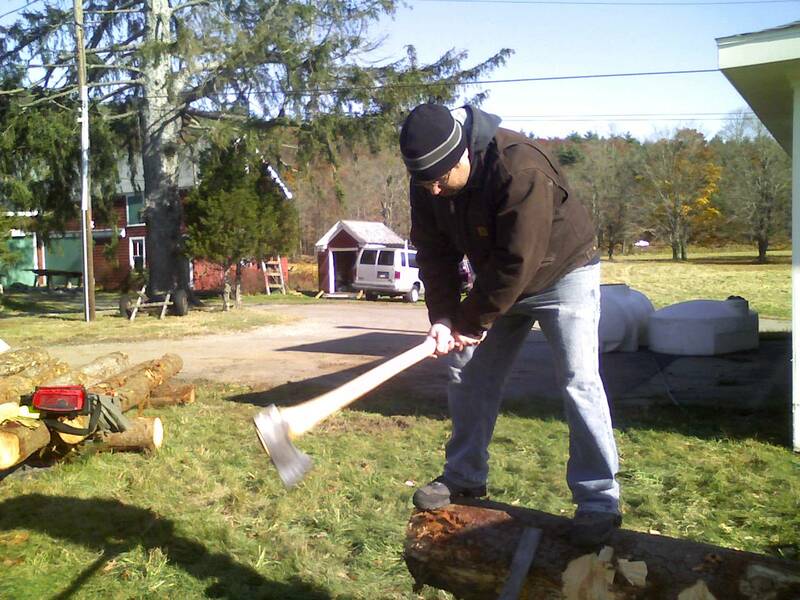 After juggling off the sides with the felling ax, we moved on to the hewing axe, the use of which could best be described as halfway between an ax and a chisel. It also makes for a great workout routine — but remember to let the ax head do the work — trying to swing as hard as you can reduces your accuracy and just wears you out faster — believe me the oak knows how tough it is. 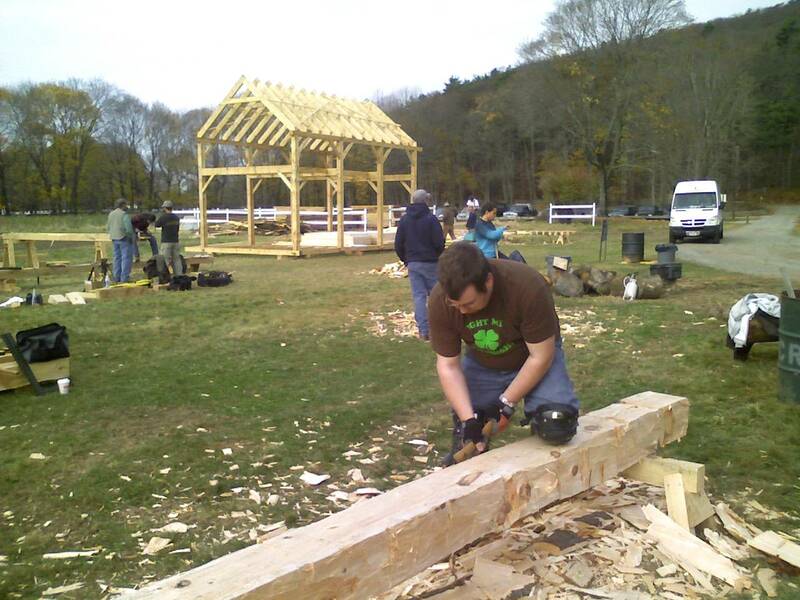 After doing a lot of square rule work with timbers from a saw mill, we all had new appreciation for how much work went into many of our historical structures in terms of manual labor. Once we had the sills ready to go the next step was to join them together using scribe rule techniques. Scribing is an intricate process which will get you handy with your plumb bob, level and scribes real fast. You’ll also learn the term ‘bump and die’ meaning if you bump into my carefully placed timber as I am trying to scribe it, I will kill you. 🙂 Death threats aside it can be a very interesting and rewarding process. This technique is especially well suited for folks working with hand hewn timbers which can often be warped, bowed, tapering, etc. and one can see how it worked well during the times when hand hewn timber was the only option available. Once the flooring system was complete the next step was repairing/replacing the large oak gun-stock posts. With our work done, the next year’s class took over and continue to work on the various pieces of this barn back in the trailer at the school.